Ongelooflijk Verburg liegt dat het GEDRUKT staat…. Hoe krijgt ze het voor elkaar, om zo glashard te liegen dat het niet te testen zou zijn, terwijl het RIVM al in 2007 aan de EU heeft geraporteerd dat er *wederom* een uitbraak was van Q-koorts, die met enige regelmaat de kopop steekt, of weet ze gewoon net als aldie andere Rechtse Rakkers in het geheel niet wat er op de Ministeries en in het land speelt, omdat ze nooit uit hun ivorentorens komt,. 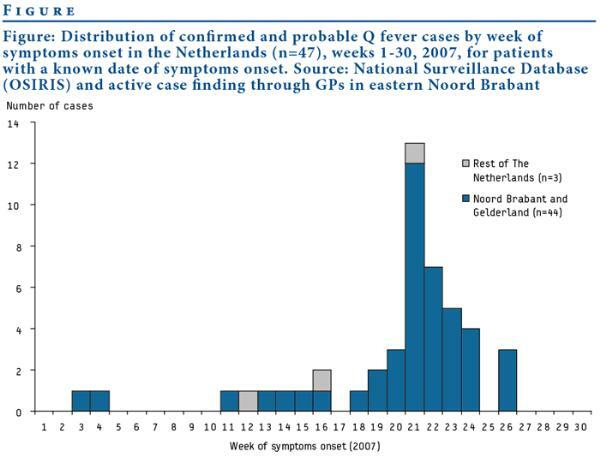 In the Netherlands, 5-20 cases of Q fever have been reported annually between 2000 and 2006. From 1 January until 2 August 2007, 63 confirmed and probable cases with Q fever have been reported to the municipal health services throughout the Netherlands. Fifty-nine of them were in the provinces of Noord Brabant and Gelderland, of which 36 were confirmed according to the used case definition. Among the 59 cases in these two provinces, 27 were living in a well defined area in the eastern part of Noord Brabant. It should be noted that retrospective active case finding was initiated in the latter area for patients with a GP consultancy after 15 May to better describe the cluster of cases there. The overall male to female ratio is 1.67 and the median age is 50 years. Date of symptoms onset is currently available for 47 of all patients. The peak of case occurrence was in week 21 of 2007. According to the data available including week 30, the last case had a symptoms onset in week 26 (Figure). Large outbreaks of Q fever in the Netherlands from 2007 to 2009 were monitored using notification data of acute clinical Q fever. However, the notification system provides no information on infections that remain subclinical or for which no medical attention is sought. The present study was carried out immediately after the peak of the 2009 outbreak to estimate the ratio between Coxiella burnetii infections and Q fever notifications. In 23 postcode areas in the high-incidence area, notification rates were compared with seroconversion rates in blood donors from whom serial samples were available. This resulted in a ratio of one Q fever notification to 12.6 incident infections of C. burnetii. This ratio is time and place specific and is based on a small number of seroconversions, but is the best available factor for estimating the total number of infections. In addition, as subclinical C. burnetii infection may lead to chronic Q fever, the ratio can be used to estimate the expected number of chronic Q fever patients in the coming years and as input for cost–benefit analyses of screening options.